As simple as Ducoterra’s SolaRay panels are to install, there are still plenty of issues to consider when mounting them! We’ve compiled a few tricks and installation tips of our units here to help you figure out the best way to mount them. One of our dealers, Heating Green, has a fantastic step by step guide showing all the steps you need to take! All SolaRay radiant panels ship with heavy duty toggle bolts – each one is rated to hold 70 pounds! 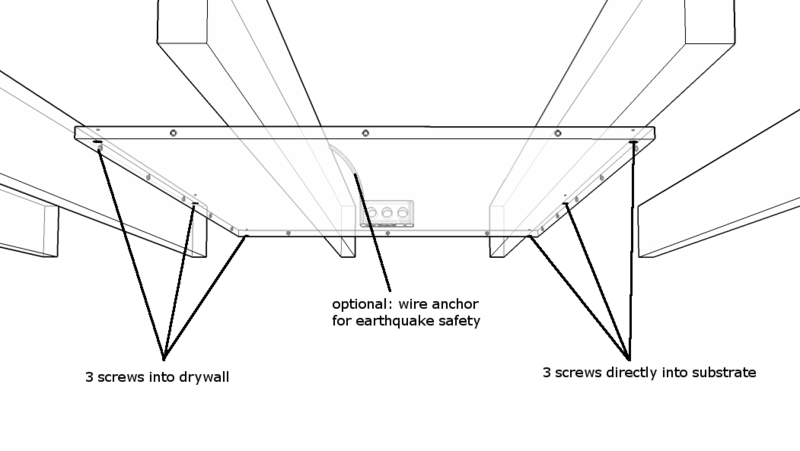 Even so, mounting in drywall has it’s problems and as such we recommend the following installation patterns for our 4′ and 6′ units, especially if you live in an earthquake prone area, for maximum safety. Click on the image for a full size version (note that the drywall/sheathing layer is NOT shown in these diagrams for clarity). Bring a friend to help! Panel installation, particularly for the larger panels, is tricky solo. A drywall lift will also help in a pinch. Position panels like you would a lighting fixture! Infrared will cover the room like a light, so space the units accordingly. Install a good programmable thermostat. One of the best ways to get the most out of your investment! ← What’s it mean to be green?